nice, but the ceiling needs a makeover. One new ceiling tile would turn this nasty shitter into a 4 star pisser! 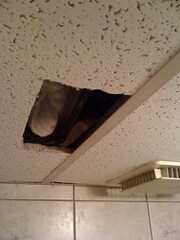 You know, it's things like holes in the crapper ceiling that really upset me too. More importantly, why hasn't anyone bothered to do anything about it?